Volunteers Needed For The 2018 Used Clothing Drive! We’re less than six weeks away from the Gifts for the Homeless annual Used Clothing Drive! Save the dates: November 30th and December 1st – 2nd , 2018! If you’ve been with us before – welcome back! And thank you for volunteering with, and donating used clothing and other items to our massive effort – the largest in D.C. We really appreciate, and count on, your support. Last year, together we were able to receive, sort, bag and deliver nearly 3,200 bags of clothing and other items to more than 55 shelters and homeless service organizations. Donate clothing and other items on Friday, November 30th or the morning of Saturday, December 1st. Our drop off location and sorting site is 2300 N Street, NW, which is conveniently located north of Washington Circle and within walking distance of the Foggy Bottom/GW and Dupont Circle Metro stops. Volunteer with us on Friday, November 30th, Saturday, December 1st, and Sunday, December 2nd (limited availability for volunteers on Sunday). We need people just willing to pitch in! Spread the word! Follow us on social media and help us create buzz! Sorting and Deliveries – Saturday, December 1, 2018 – 8:00 a.m. to 6:00 p.m. Location: 2300 N Street, NW. This location is north of Washington Circle and walking distance from the Foggy Bottom and Dupont Circle Metro stops. Parking will be available. Donation Categories: These are the donated items that we accept. The greatest need is always for warm winter items. We prefer that donations come to us unsorted (unless we have set your company up as a “pre-sorter”), but you can save our sorting volunteers time if you want to separate out women’s, men’s and children’s, but that is completely optional! If it won’t fit into one of our categories, we ask that you find another place to donate it (Goodwill or similar). The Used Clothing Drive, now in its 32nd year, is a unique event, where 100 (or more) law firms, government agencies, corporate law departments, legal vendors, as well as the community at large, will come together to donate, sort, and deliver used clothing and other items to be distributed to homeless men, women and children in the greater Washington, D.C. area. GFTH is an all-volunteer nonprofit, with no paid staff. We rely solely on our Board, Leadership Council, and volunteers to fulfill our mission. We are a 501(c)(3) charitable organization, and 100% of every dollar we receive from public donations is used to purchase essential winter clothing and items to keep the homeless in D.C. warmer during the winter months. Our Used Clothing Drive also includes the opportunity for us to raise dollars from our donors – and we ask our Used Clothing team members to help support fundraising at your firm or organization to the greatest extent you can. Our goal for 2018 is to make this the biggest Used Clothing Drive in our history – but we’ll need your help to do it. You can see photos from past drives and our signature fundraising event, Banding Together, and learn more about us at our website, www.gfth.org. What: GFTH receives gently used clothing donations during the drive weekend only. Prior to the drive, our board and leadership council members and volunteers contact 60+ area shelters and other organizations who serve the DC area homeless to find out who they service and what type of clothing meets their greatest needs. This is so that those organizations receive used clothing donations that are most needed. During the weekend of the drive, our volunteers help sort the clothing by categories and deliver thousands of bags of donations to 60+ Washington, DC area shelters and other organizations to provide services to assist those experiencing homelessness. This is a once a year opportunity to spend a few hours with other joyful volunteers during the holiday season to help local men, women and children in need. Information about our clothing past clothing drives can be found here and here. 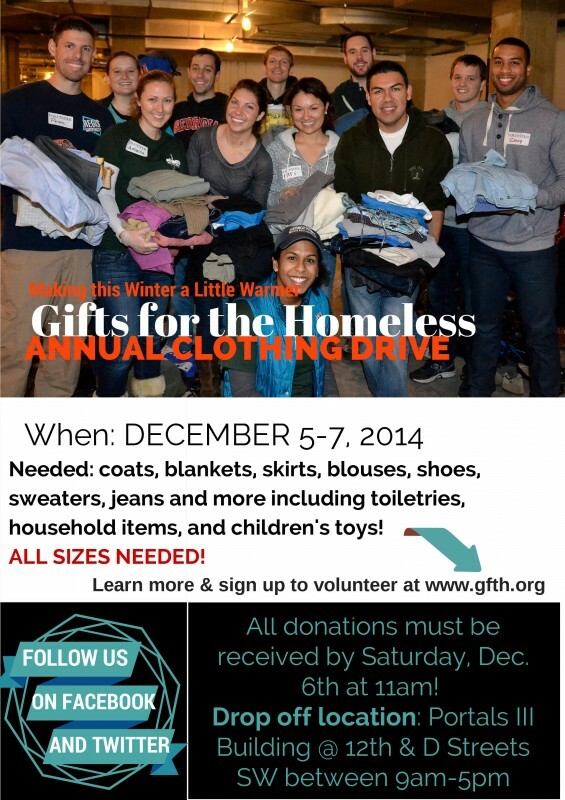 The 2014 GFTH Used Clothing Drive may be over – until December 4-6, 2015 (SAVE THE DATE!) – but the need in the greater Washington, D.C. community continues on. If you have used clothing that you wish to donate, we urge you to make arrangements to donate it directly to one or more of the following organizations, each of which accepts used clothing donations year ‘round. 1640 Good Hope Road, S.E. Please note that Gifts for the Homeless provides new and used clothing to approximately 70 shelters and homeless service organizations in the greater DC area. A full list of the recipients we serve is HERE. While we encourage donors to support ALL our recipient organizations in whatever way we can, in our shared, grass-roots effort to clothe the homeless, we are keenly aware that most of them have limited space in which to store donations. We have found, however, that the seven organizations listed above generally have ample space. But just to be safe – call or email ahead to tell them you are coming! 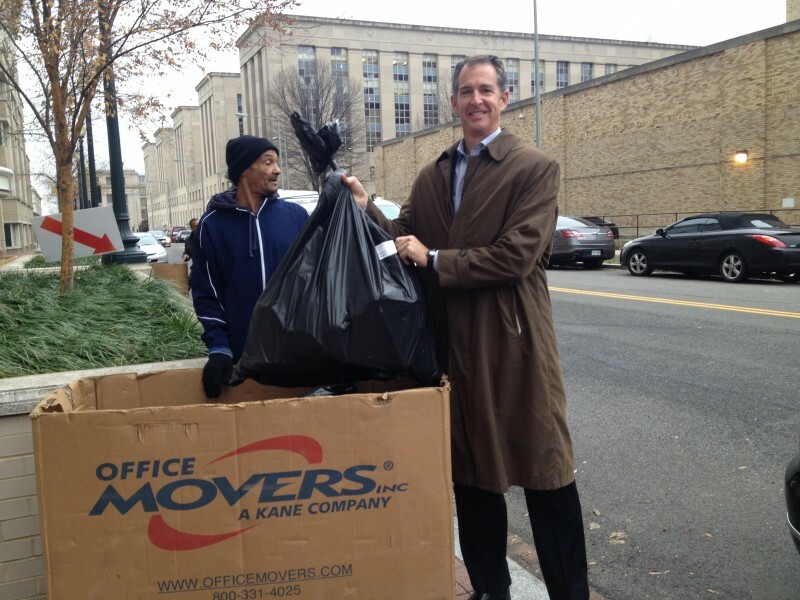 We are grateful for the DC area law firms that generously support and participate in our annual used clothing drive each year. One major way that law firms assist with the drive is by conducting their own local (or “feeder”) clothing drives in their offices prior to the GFTH used clothing drive event — this year, on Friday, December 5th through Sunday, December 7th. The support enables us to receive nice clothing that will be appreciated and used by less fortunate members of the local community who access services from 65+ area shelters, food providers, and other organizations that receive and distribute our donations. When you start getting ready for our drive is entirely up to your firm, but you it is best to plan on concluding your drive and delivering your collections to our central sorting site on Friday, December 5th. There are a variety of creative ways to promote the drive to your employees and staff to maximize donations — the possibilities are endless. We also encourage firms in shared buildings to ask their fellow firms and commercial neighbors to contribute to their drive. Not only does that help GFTH and those who we serve, but it also builds positive relationships with others in the local business community. Above all, our greatest need is for warm winter clothing, but we will accept all types of clothing: business, casual, coats, sweaters, sweats, long and short-sleeved shirts, pants, shoes and socks, hats and gloves. But, no underwear or swimwear. The clothing can be for men, women or children, including infants and toddlers! It should be gently worn, clean, and free of rips and tears. Our philosophy is: if we wouldn’t wear it, we wouldn’t expect a homeless person to wear it either. Also note that because we have a large NEW clothing program, supported by your monetary donations, we do not encourage individuals to go out and purchase any NEW clothing to donate to this USED clothing drive. We get much better deals buying in bulk from clothing manufacturers than any individual can buying retail. We also accept: sleeping bags and blankets, travel-sized toiletries, sheets and pillowcases, towels, luggage, toys, children’s books, and small household items (like dishes, silverware, pots and pans, placemats, etc. — but no larger appliances like TVs or microwaves or furniture). No food, please. What is Presorting and Why is it Helpful? Please know that one of the many great things about GFTH is that we strive to provide shelters with the very items that they need. It is for that reason why GFTH Board and Leadership Council Members spend months in advance conducting outreach to homeless services provider organizations to determine who they serve (men, women, and/or children) and what types of items are needed (i.e., a men’s shelter may need men’s sweaters and sweats, but not men’s shoes or women’s clothing) so that they can be put to good use. For this very reason, we have created a list of categories of items that we collect. In order to help speed-up deliveries to the homeless services organizations during the course of the GFTH Annual Used Clothing Drive, we appreciate when law firms — particularly large ones that often have large amounts of generous donations — pre-sort by clothing category and bag the items collected in-house before they are dropped-off at the sorting site. Pre-sorting can be fun — yes that is true! At the tail end of collections, some firms will hold pre-sorting parties, provide pizza or snacks, and use the opportunity to spread some cheer in the office and spend meaningful non-billable hours with coworkers. To help with your pre-sorting efforts, we present our 2014 categories below. If you or your firm would like to participate in this year’s GFTH annual used clothing drive, please contact Joe at JEdmondson@foley.com Go firms!